Note: The values given above are applicable only when the IC operates at 5V. Complete Technical Details can be found at the HEF4013 datasheet given at the end of this page. Where to use HEF4013 D Flip-Flop? 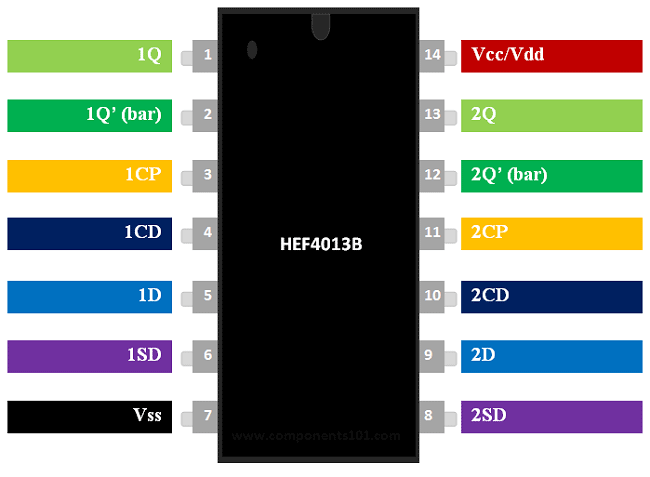 The HEF4013 is a 14-Pin SOT-14 IC from Nexperia which has two D Flip-Flops inside a single package. Each of these two Flip-Flops can be used individually based on our application. The flip-flops are also called as latching devices meaning it can remember one single bit of data and due to this ability the D-Flip Flops are used in time delay circuits, Sampling circuits and even as buffer circuits. Normally D flip-flops are used in digital circuits in combination with other Gates or Flip-flips. 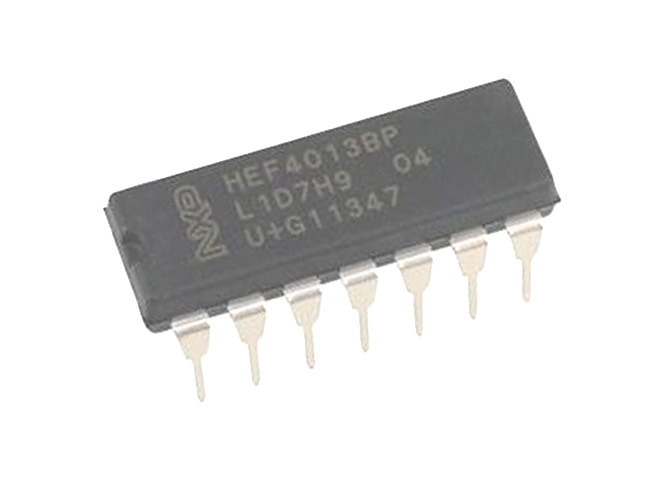 So if you are looking for an IC for latching purpose or to act as a small programmable memory for your project then this IC might be the right choice for you. Also If you are looking for an easy to use breadboard friendly PDIP equivalent check out CD4013BE from TI. How to use D Flip-Flop (HEF4013)? Using a Flip-Flop is pretty straight forward. Simply power the IC using the 7th and 14th pin. As told early each flip-flop operates independently, just connect the input signals 5 and 6 for using the 1st flip-flop and you will get the output at pins 1 and 2. The pin 3 should be provided with a clock source normally a PWM signal from a MCU or 555 timers are used. The pin a can be used to clear the data and reset the flip flop by making it high. The complete working of the Flip flop can be understood by taking at the function table below. The symbol “X” indicates don’t care and the up-arrow indicates the rising edge of the signal. You can also simulate the IC to check if it would work as desired. Here I have used logic state and logic bits to view if the IC functions as it is supposed to, but you can replace them with actual circuitry of your application to check if it would suit your need. The gif file shown below can be verified with the truth table to above to make sure that the IC works as desired.